Local resident Barbara Gage Mulford creates slightly impressionistic but representative works, usually in acrylic on canvas, but often with oil, watercolor, ink and charcoal. 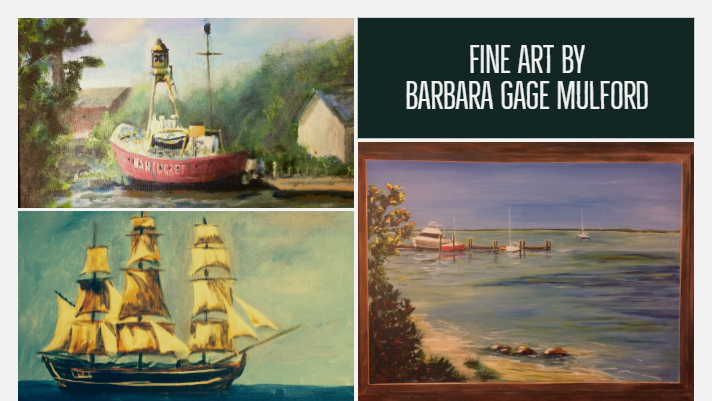 Barbara paints from the heart, usually subjects dear to her; Florida beaches, the Arizona desert, animals and people having fun. With a strong interest in history, some of her work includes historical architecture and local legends, including the pirate Gasparilla. Barbara participated in the 2018 ArtPoems shows and book. She exhibits regularly at Arts for ACT and the Art League of Fort Myers. Barbara teaches painting at the Arts For ACT Gallery and several other locations. She can usually be seen painting live during Art Walk and Music Walk at the Arts For ACT gallery in Fort Myers. Look for her signature; B Gage.